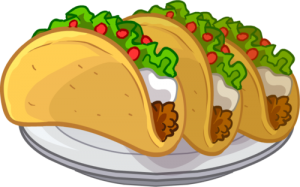 Who doesn’t love tacos?! 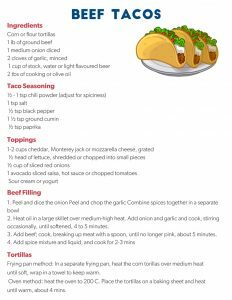 These beef tacos are mouth-watering, delicious and easy to make and customize. Filled with fresh ingredients and juicy ground beef, they’re the perfect lunch or dinner item! 2. Heat oil in a large skillet over medium-high heat. Add onion and garlic and cook, stirring occasionally, until softened, 4 to 5 minutes. 3. Add beef; cook, breaking up meat with a spoon, until no longer pink, about 5 minutes. Frying pan method: In a separate frying pan, heat the corn tortillas over medium heat until soft, wrap in a towel to keep warm. Oven method: heat the oven to 200 C. Place the tortillas on a baking sheet and heat until warm, about 4 mins. Get down and dirty in the kitchen with us, and eat your way to better health! Our frequent cooking sessions include a nutritional presentation, cooking demos and a chance to practice your cooking skills in an accessible kitchen. Plus, you'll get to taste each dish and take the recipes (and leftovers) home. Check out our Events Page for details.